The 1978 men’s basketball team that led then Palm Beach Junior College to its first state title is returning to campus for a reunion celebration. PBSC will welcome back and recognize the eight-player team of Michael Bennett, William (Bill) Buchanan, Dirk Jamison, Shack Leonard, Jr., Paul Mercak, Michael Owens, Derrick Paul, Sammy Weathersbee and their coach Joe Ceravalo and assistant coach Willie Gibson at halftime during the men’s basketball game starting at 4 p.m. Jan. 26 in the gym on the Lake Worth campus. 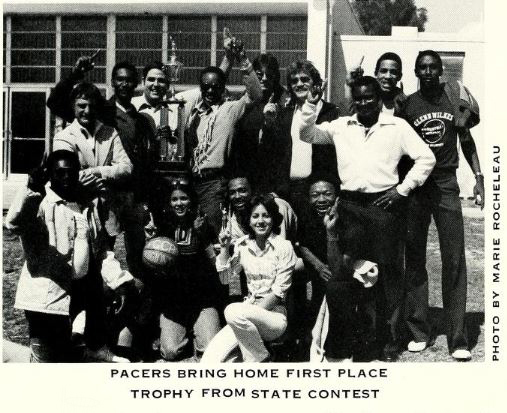 The team, formerly known as the Pacers, took the state championship title on March 4, defeating Pensacola (then current champs), Seminole and finally Florida College. The final score was Pacers 87 to Falcons 85 with Jamison and Buchanan clinching the game. They not only became the best in Florida, they did it with only eight players, a smaller team than the average 12 to 15 member team. Six members had to drop out because of low grades, leaving the remaining players the task of learning to play two or three positions. Leonard and his teammates then traveled to Hutchinson, Kansas to play in the national tournament. Even though they didn’t clinch the title, they ended up being ranked seventh out of 700 junior colleges in the NJCAA with Independence College taking first and Niagara College (the 1977 champ) runner up. Joe Ceravalo was perhaps the greatest basketball coach in PB COUNTY history. Loved watching them…most of us. Lived at Topper House! !